The principal pharmacological action of sodium nitroprusside is relaxation of vascular smooth muscle and consequent dilatation of peripheral arteries and veins. Other smooth muscle (e.g., uterus, duodenum) is not affected. Sodium nitroprusside is more active on veins than on arteries, but this selectivity is much less marked than that of nitroglycerin. Dilatation of the veins promotes peripheral pooling of blood and decreases venous return to the heart, thereby reducing left ventricular end diastolic pressure and pulmonary capillary wedge pressure (preload). Arteriolar relaxation reduces systemic vascular resistance, systolic arterial pressure, and mean arterial pressure (afterload). Dilatation of the coronary arteries also occurs. In association with the decrease in blood pressure, sodium nitroprusside administered intravenously to hypertensive and normotensive patients produces slight increases in heart rate and a variable effect on cardiac output. In hypertensive patients, moderate doses induce renal vasodilatation roughly proportional to the decrease in systemic blood pressure, so there is no appreciable change in renal blood flow or glomerular filtration rate. In normotensive subjects, acute reduction of mean arterial pressure to 60-75 mm Hg by infusion of sodium nitroprusside caused a significant increase in renin activity. In the same study, ten renovascularhypertensive patients given sodium nitroprusside had significant increases in renin release from the involved kidney at mean arterial pressures of 90-137 mm Hg. 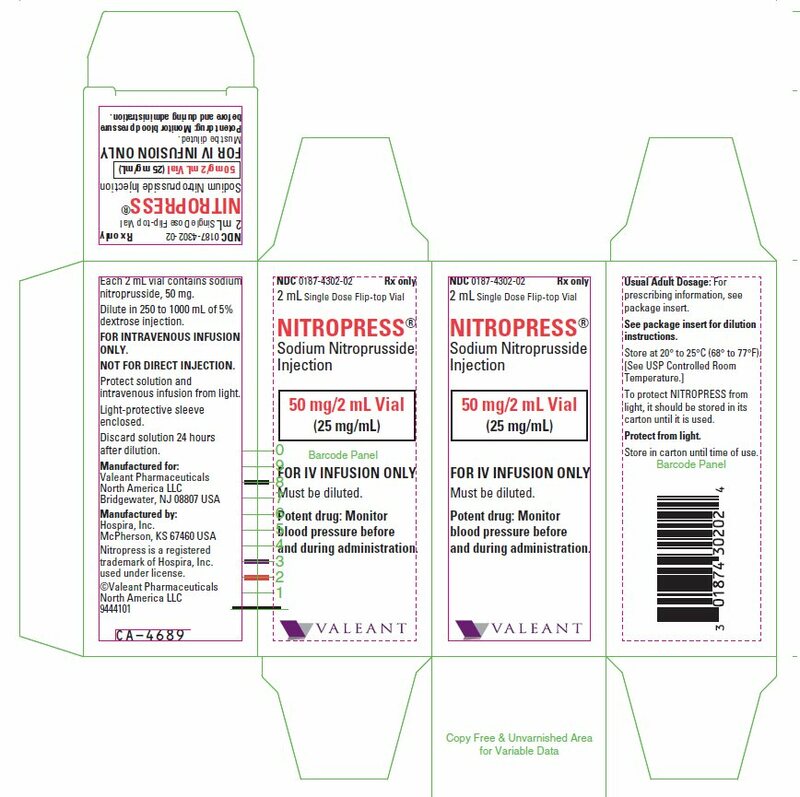 The hypotensive effect of sodium nitroprusside is seen within a minute or two after the start of an adequate infusion, and it dissipates almost as rapidly after an infusion is discontinued. The effect is augmented by ganglionic blocking agents and inhaled anesthetics.